Home / Katonomics / statistics / WIPO / World Intellectual Property Indicators - What's happening in your neighbourhood? World Intellectual Property Indicators - What's happening in your neighbourhood? WIPO yesterday released their annual World Intellectual Property Indicators report. The 2015 edition tracks the sustained growth in IP activity around the world, and the continued rise of China in patent and trade mark applications. 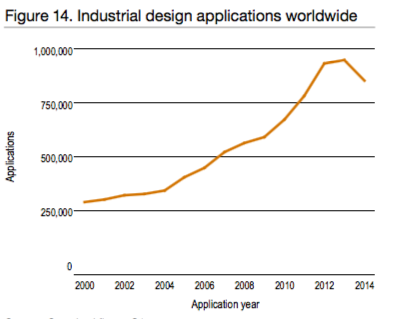 Overall, the picture is what we would expect as IP activity increases, with the exception of industrial designs. Prepared by the good statisticians from WIPO's Economics & Statistics Division, the report covers patents, trade marks, industrial designs, and plant varieties. Ever wondered how Estonia ranks in international patent activity? 70th. Who is the 41st most active patent applicant in the world? Zhejian University in China. Where do the most active applicants for plant varieties come from? The Netherlands. There are also lots of pretty charts, colourful maps and tables. WIPO Infographic, click for full size. 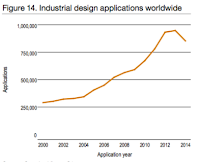 The big surprise, however, is the fall in applications for industrial designs. After more than two decades of growth, a 'sharp decrease' at China's SIPO has contributed to an 8% decrease in applications. Your Katonomist speculates that this reflects a shift in Chinese firms' IP strategy towards patents; can readers illuminate? In general, data like the WIPI is handy for looking at trends and relative measurements. Differences can indicate underlying changes, such as shifts in innovation, economic growth, IP strategies, or simply changes in data collection. Keep in mind that even when there are measurable changes, they may be statistically meaningless. Some differences will happen simply because of chance. Looking for good party tricks? Delight your friends and family this holiday season by downloading the data and wowing them with exciting facts. Say, did you know that Wikimedia was one of the top 20 Madrid applicants in 2014? Now you do.